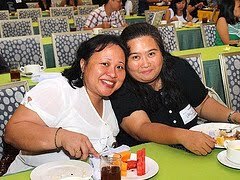 Thunderbird Resorts-Rizal hosted this fun-filled event last April 16th. Meet-up venue for 200 registered bloggers was at Salcedo Village in Makati, were two buses awaited and brought us to Thunderbird Resorts Rizal. Upon arrival at 11AM, loot bags containing a 100-worth Fiesta Casino voucher, notepads, pen and flyers were given at the registration area. 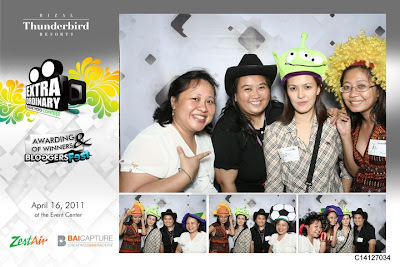 Baicapture photo booth was also there at Thunderbird Resorts' Event Center. The program opened with the awarding of the winning Thunderbird Resorts Extraordinary Video entries which best depicts “What Makes You Extraordinary?” question and garnered the most votes online that ran from March 1-25, 2011. The Grand Prize Winner took home 100,000 cash prize and Vacation Getaway, while the Five Most Voted Videos received Consolation Prizes of 10,000 Thunderbird Resorts Gift Certificates, 5000 Cash Prize and Enjoy Philippines cards. The panel of judges that included Anton Diaz of OurAwesomePlanet.com, videographer Bob Nicolas, Prof. Patrick Campos of the UP Film Institute and Thunderbird Resorts Chief Sales & Marketing Officer Felbin Soto selected the winning entry out of the 58 videos. We were treated to a lunch buffet shortly and then co-bloggers were asked to do give tutorials and share experiences on Blogging 101, Personal Blogging, Photo Blogging, SEO, DNS and Domains, Overcoming Writer’s Block and Blog Security. Kudos to Azrael Colladilla and Thunderbird Resort, in partnership with Travelbook.ph, Nuffnang, Enjoy Philippines, Baicapture, SolidHosting.PH, Dependable Printing, Perfect Renders and Manila Bloggers Network for making this successful feat! It was my first time to join a Bloggers Fest and I have to say that I'm glad I did! It was an awesome learning experience and I wouldn't pass up another one for the world!